Home Buying Process Flowchart ... What needs to be done and when to do it! You Deserve An Accredited Buyer Agent! Buying A Short Sale - Is It Right For YOU? Most Recent Sales History ... 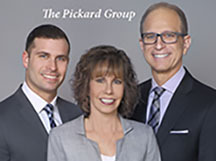 Buyers, Sellers & Investors with The Pickard Group! "Property Finder" - YOUR Home Research Center! Property Search - The Most Complete Database of Homes For Sale or Sold. Rentals Too! Your Credit Score - Tips! Don't Bite Off More Than You Can Chew! Discounted Storage for Your Move - PODS! Why List Your Home with The Pickard Group? Local Market Share - Homes Sold in Your Area! To Fence or Not To Fence? De-Clutter and do a good deed! You Can Sell Your Home in the Winter! 3.8% Medicare Contribution Tax 2013 "Obamacare"
Why Invest in Rental Real Estate? Rental Real Estate or Stocks? Paying Too Much in Property Taxes? Meet Your Team - Designed to deliver RESULTS! Professional Profile - Uniquely qualified to serve all your real estate needs! What We Do - It's All About YOU! Our Purpose - What It Means For YOU!